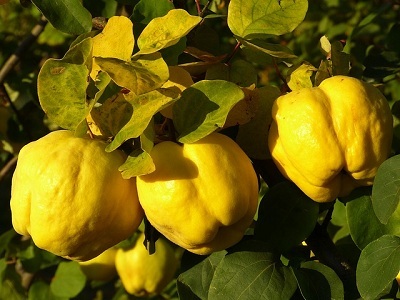 Quince has been known for ages and was popular in ancient times. It gains popularity by its aroma and delicacy. Today, this fruit usually stays under the radar even though it shows many health benefits. Quince comes from Asia Minor and autumn is its time. If eaten raw its taste is not attractive. Quince is sour, tart and possesses astringent qualities. On the other hand, if cooked properly, quince smell extraordinary and its taste is simply delightful. Nutritionists find this neglected fruit especially nutritious. Namely, quince contains dietary fiber, vitamin C, iron, zinc, copper, potassium, magnesium, and B-complex. Moreover, it has important elements such as tannins and is especially rich in catechin and epicatechin. For that reason, many studies show numerous health benefits of quince. Some of them even claim that this miraculous fruit is good at battling and preventing cancer. Among various benefits, quince may improve immunity, regulate blood pressure, soothe digestion problems, increase circulation, minimize allergies, renew skin, etc. To learn more about the health benefits of quince, the article “15 Amazing Health Benefits of Quince Fruit” lists the following. Many people cook quince in water, adding a small amount of ginger, cinnamon, and vanilla. Some people make a delicious pie and a receipt is similar to apple pie. With one exception – added water. Quince is pretty dry and to be sure that the pie texture is soft and puffy, we need to add at least one glass of water before we put the pie into an oven. We may also add quince when preparing meat or some other delicacy. It adds a special flavor. In short, there are no limits when it comes to its usage. How we will prepare quince and benefit from its beautiful aroma, depends on our creativity. When we have in mind a great many health benefits of quince, we will not be surprised that more and more people treat it as a superfood. Next story How to Prevent Kidney Stone?